Last Friday, the 16th of March, Newbridge College hosted it's first ever senior girls rugby match. Wesley looked for a return fixture and seeing as Newbridge won the last encounter there was a slight nervous energy around the team prior to kick off. I think the lack of a bus trip unsettled the team. This was reflected in the manner in which the 1st half was played, however, Newbridge still held a 2 point lead at half time. Tries came from Ivanna Dempsey and Sophie Lyons with conversions taken by Sophie for one of the tries and Victoria Chanders who took the remaining kicks. In the away fixture in Wesley, we managed to keep them out so there was a marked difference when the team had to stand behind the posts on a number of occasions. I think it was the motivation they needed to make amends to the game play. The 2nd half showed more of what this team is made of and at times it was an exhibition of how the game should be played. Doireann Halpin got a well deserved try for herself from a sneaky run in the 9 position while Sophie crossed the whitewash a few more times (3 in total). However, I think the standout memory will be in the defensive heroics by Ruby Udell just at the whistle. Ruby chased a Wesley player from inside the half to prevent a certain try in the corner. It wouldn't have won the match for the visiting side but it showed the character that is developing in this team in such a short space of time. Final score; 40 points to 29. Other Results: Junior A 45 Kilkenny 31; Eller A 14 Castleknock 24; Eller 42 Castleknock 12; Eller Black 26 Castleknock 26; Eller White 31 Castleknock 12. More great results from the Equestrian Club. 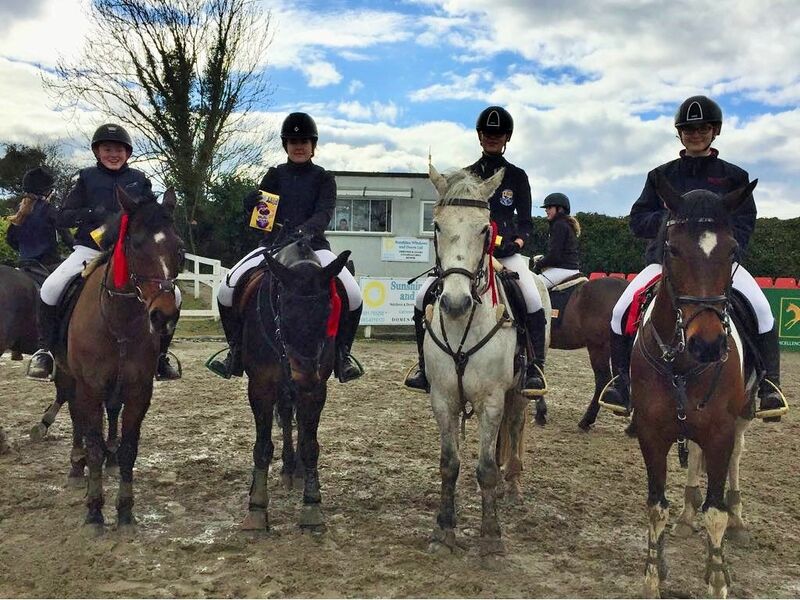 Four riders competed in Galway Equestrian Centre on Saturday the 31st of March. The 5am start for Caragh Sweeney, Leah Heffernan, Niamh Flinter and Niamh Behan was worth the long trip as they won after a great jump off. Niamh Behan went on to win the Open Individuals with Niamh Flinter coming 2nd in the 110cms HSI qualifier. Sunday the 8th of April saw two teams head across to Claregalway for the last week of the TRI Equestrian Interschools League. Both of the Newbridge Teams got into the jump off with the team of Caragh Sweeney, Leah Heffernan, Niamh Flinter and Max Ross taking 1st place and the team of Niamh Behan, Lucy Ross, Leah Ross and Jack Ross taking 2nd. There was a clean sweep in the Open Individuals with Niamh Behan taking 1st, Max Ross 2nd, Leah Ross 3rd and Niamh Behan 4th.